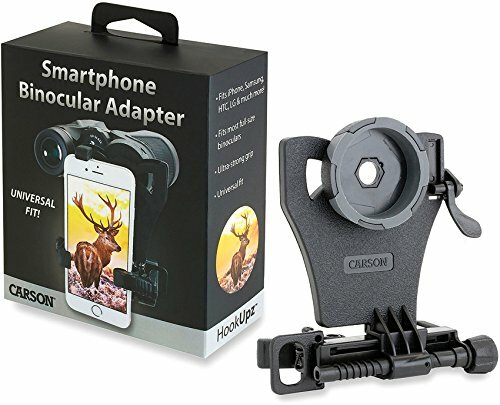 The HookUpz Universal Smartphone Binocular Adapter from Carson easily connects your smartphone to most full sized binoculars (32mm-50mm Objective Lens Diameter). Use your built-in camera application on your smartphone to take pictures and record video through the lenses of your binoculars and email or text family and friends or share them on social media. The HookUpz Binocular Adapter comes included with two interchangeable rubber rings that allow the adapter to fit most full sized binoculars that have an outer eyepiece housing diameter between 40mm-44mm. Once you determine which rubber ring fits the best, press firmly to secure a tight hold around your eyepiece. The HookUpz Binocular Adapter is adjustable to fit most popular smartphones in the marketplace (up to 3.75 inches wide in portrait orientation) including Apple (iPhone), Samsung (Galaxy/Note), HTC, LG and more. In most instances, there is no need to remove your phone's case. However, some larger, thicker phone cases may need to be removed. Please see the Sizing Guide under the Product Details Section for additional sizing/compatibiliy information. There is now no need to worry about purchasing a new digiscoping adapter each time you purchase a new phone. The set up is easy. There are no complicated parts or pieces. The ultra strong grip on the HookUpz adapter ensures your smartphone is safe and secure. Please note that the Binocular adapter is NOT COMPATIBLE with RIFLESCOPES, TELESCOPES, MICROSCOPES or TABLETS. The HookUpz Binocular adapter is the perfect digiscoping device for bird watching, sight-seeing, hunting, sporting events, concerts, law enforcement surveillance and so much more. It is backed by Carson's Limited Lifetime Warranty. Be sure to capture everything that life has to offer with the Carson HookUpz Smartphone Binocular Adapter. If you have any questions about this product by Carson, contact us by completing and submitting the form below. If you are looking for a specif part number, please include it with your message.